For Iphne 8/8P/X after maintence and replacement of LCD screen, the automatic photoreceptor function will disappears, IPHONE 8 8P X Sensitive Repairer Brightness Adjustment Mobile LCD Chip Programmer Automatic Photoreceptor Recovery Adjustment Brightness. 2. Available in both Chinese and English versions, follow-up upgrade bilingual switching, to meet the needs of customers around the world! 3. Support Apple 8, 8p and X mobile phones, saving the cost of purchasing tools! 4. You can back up more than 200 chip files and upload them to your computer. 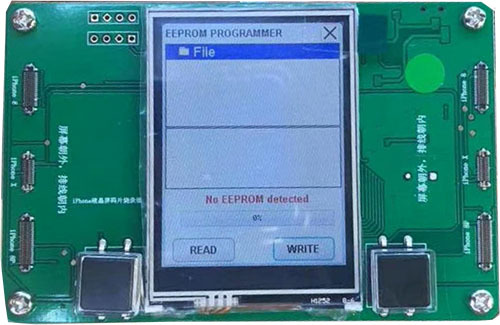 The function of this function is that after replacing the original screen of the customer with the assembly screen, we can back up the chip file of the original screen! If the customer's assembly screen is damaged again, we can easily replace it with a piece of assembly screen and replace it! 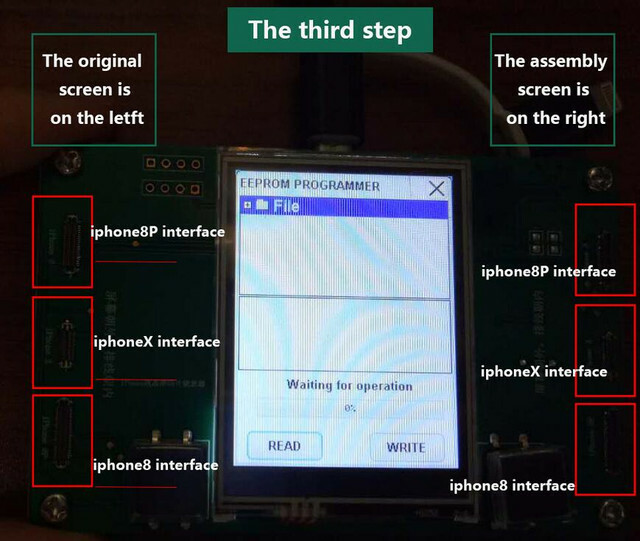 First use the original screen to use it，read the photosensitive data from the original screen and re-write it to the assembly screen for iphone 8 8P X. How to use Iphone 8 8P X Photosensitive Repair programemer? 1. you need to prepare an android cable, turn it on, the screen lights up automatically when the power is on. so let's do that. 2. Click on the first icon, let's go to the next screen, the following figure. 4. Once the assembly and orginal screen are in place, click read, can read and write, after successfull reading, click on the right to write, after you have written, the photosensitive repair of the assembly screen was successful.